Branscombe’s harvest weekend takes place on Saturday 16th September with the Fair from 12-4, and on Sunday 17th September with the Harvest Festival service in church at 11.15. Lots of fun for all, and the opportunity to give thanks for the bounty of the land, our food and the people who produce it. 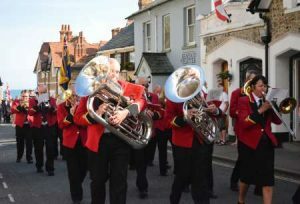 Colyton Carnival will soon be here, and Songs of Praise in St Andrew’s will be on Sunday 10th September at 2.30. This year we welcome Ottery Silver Band to play some of our favourite hymns. Our friendly playgroup for babies and toddlers continues this term and everyone is welcome. Please come along on alternate Thursdays from 1.45-3.15 at Colyford Memorial Hall. The dates are: Sep 7 and 21; Oct 5 and 19; Nov 2, 16 and 30; Dec 14. Colyton’s 3rd Sunday breakfast starts at 10 with the service at 10.30 – everyone is welcome!